Asteroid Data Hunter. NASA's Asteroid Data Hunter contest series was part of NASA's Asteroid Grand Challenge, which is focused on finding all asteroid threats to human populations and knowing what to do about them. A software application based on an algorithm created by a NASA challenge has the potential to increase the number of new asteroid discoveries by amateur astronomers. Analysis of images taken of our solar system’s main belt asteroids between Mars and Jupiter using the algorithm showed a 15 percent increase in positive identification of new asteroids. Through NASA's asteroid initiative, the agency seeks to enhance its ongoing work in the identification and characterization of near-Earth objects for further scientific investigation. This work includes locating potentially hazardous asteroids and identifying those viable for redirection to a stable lunar orbit for future exploration by astronauts using NASA’s Space Launch System rocket and Orion spacecraft. The Asteroid Grand Challenge, one part of the asteroid initiative, expands the agency's efforts beyond traditional boundaries and encourages partnerships and collaboration with a variety of organizations. The algorithm contests were managed and executed by NASA's Center of Excellence for Collaborative Innovation (CoECI). CoECI was established at the request of the White House Office of Science and Technology Policy to advance NASA’s open innovation efforts and extend that expertise to other federal agencies. 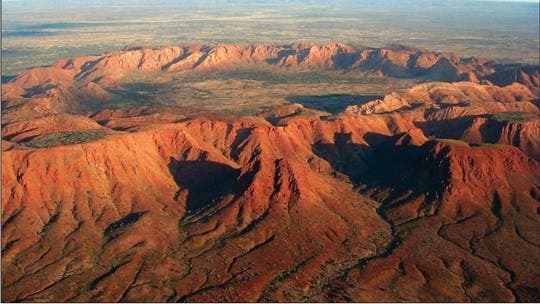 Around 142.5 million years ago Gosses Bluff crater shown at the top of the page was formed by an object thought to be around 600 meters in diameter. The crater we see today is actually a lot smaller than the original depression due to erosion. Its diameter currently stands at 5 kilometers m, the original diameter thought to have been closer to 20 kilometers.